Diecutting Punches – Feed-Thru – AmeriKen Online! Feed-Thru punches are made from seamless tubing and widely used by felt, leather, and gasket manufacturers. 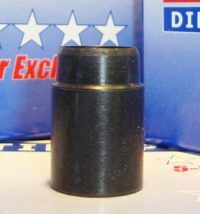 The inside diameter is relieved from the back to give wide inside clearance, allowing pills to clear smoothly through the base of the punch. This eliminates stripping and permits heavier material to be cut. “T” indicates Thin Wall, “XT” indicates Extra Thinwall. “QUOTE” indicates special sizes quoted on request. Standard Height: .937. Additional heights available: 1-1/8″, 1-1/4″, 1-1/2″, and 2″. Special hole sizes, heights, tube sizes and bevels. Also available for abrasive materials. Other sizes available on request. Case hardened by vacuum carbonitriding. The Ultimate concept in Feed-Thru Punches! AmeriKen’s exclusive KUTS-ALL line is unmatched in the industry. The KUTS-ALL was developed to cut specialty items in the abrasives industry or to cut any material, such as adhesives, which is hard-to-feed. Special angles have been engineered on the exterior and interior bevels which “grab the waste”, resulting in a punch that cuts longer, grabs better, and sets up faster! Results are outstanding. 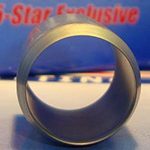 ♦ Available in diameters of 3/16″ and larger. When it comes to punching extra thick, tough materials, these special feed-thru punches are a cut above the standard line. They make easy work of cutting through rubber, plastic, plywood, chipboard – and will even “stack cut” materials up to 1/4″. Whenever you feel you may have a job in which a standard feed-thru punch may be too light, rely on these specials to do the trick. They are manufactured to precision tolerance from high carbon tool steel for extra long life. They cut sharp and stay sharp…assuring you increased production and less down time than any other punches on the market today. Standard Height: .937, (± .001 Tolerance). 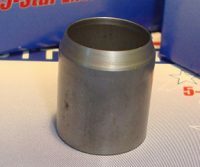 High carbon tool steel vacuum hardened. These economical oval shaped punches are engineered from our standard feed-thru line, ensuring stripping. Oval Feed-Thru punches do not have full radius ends. 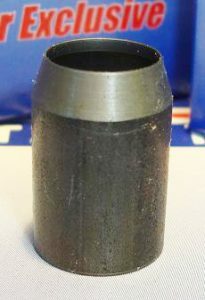 If a full radius is required, specify a custom-made AmeriKen punch. Standard Height: .937. Other sizes available on request. Also available in Heavy Wall. Case hardened by vacuum carbonitriding.